Ultra-premium packaging from the ground up. 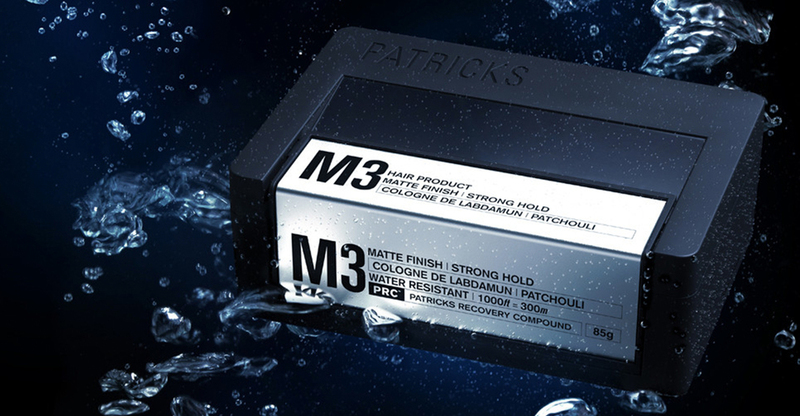 At $60 per SKU and up, the Patricks line of men's grooming products required ultra-premium packaging to support the brand's ultra-premium positioning. Studio One Eleven devised a design. The resulting elegant, rectilinear, aluminum-accented, 100% custom package forms – inspired by elements from both personal electronics and automotive design – not only contrast dramatically with the category's ubiquitous circular jars and tubes but also deliver a unique sensory experience for both the hand and the ear. The front edge and base of the injection-molded polypropylene package are fused with thick plate aluminum to create a machine aesthetic. The minimalist Patricks logotype is debossed on the cover, reinforcing the hard-goods image, while labels are laser-etched directly onto both aluminum surfaces with a tightly structured communication architecture that facilitates product selection. A thin rubber gasket seamlessly integrates into the aluminum base to prevent slippage in wet areas, protect bathroom surfaces, and create an audible solidity when putting the package down. The front edge functions as the closure latch, swinging forward to free the lid and reveal a well containing the product.